The industrial symbiosis network in Norrköping is a telling example of how synergistically integrated industrial, urban and agricultural activities can play a key role for improving regional sustainability. In addition to significantly improving resource use efficiency and associated economic and environmental performance, the network in Norrköping reduces regional dependence on fossil resources and contributes to the development of a bio-based economy. Located at the mouth of the river Motala Ström and at an inlet from the Baltic Sea, the municipality of Norrköping has 130 000 inhabitants. Norrköping has historically been an industrial center, known for its textile industries and even nicknamed "Sweden's Manchester". Currently, this port city is home to important logistics services, industries working with agricultural and forestry products as well as recycling, and hosts a campus of Linköping University. 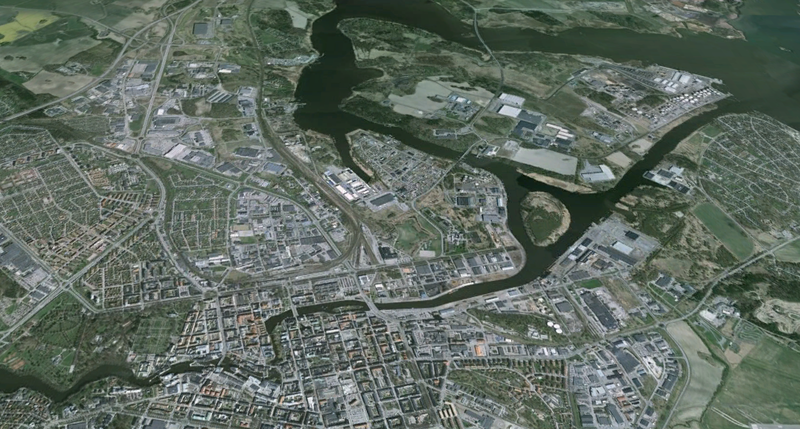 Norrköping is also home to an industrial symbiosis network involving diverse range of symbiotically connected private and public sector actors. Key actors of this network and their synergistic connections are depicted in the diagram below. The municipality of Norrköping was one of the first in Sweden to install and operate a district heating system. This system is now served by a combined heat and power (CHP) plant. The municipality has also been a key player for the modifications made to this CHP plant that enabled the utilisation of alternative fuel sources (see below). Today, the municipality provides the CHP plant with household waste (~ 25 000 t/y) as fuel, and the municipality is a key customer for the heat, electricity and cooling produced by this plant. A publicly owned combined heat and power plant, Händelöverket, was established in an island just outside Norrköping in 1982. The plant was privatised in early 1990s and is today owned by E.ON Sweden. Numerous upgrades were made in this plant, most notably in early 1990s to utilize biomass, and later in 2002 and 2010, to utilize domestic and industrial waste as fuel - thereby replacing coal. Today the plant is dominantly fueled with forestry residues from the region (~ 480 GWh/y), as well as domestic (~ 580 GWh/y) and industrial waste (~ 980 GWh/y) sourced from Norrköping, from other Swedish municipalities, and other European countries. Today, this plant provides district heating (~ 1130 GWh/y – used mainly in Norrköping but also in other municipalities in the region), electricity (~ 320 GWh/y), some district cooling, and industrial steam (~ 500 GWh/y) that meets the deman from neighboring Agroetanol. Lantmännen Agroetanol is owned by the Swedish agricultural cooperative and produces grain-based bio-ethanol with high environmental performance. The plant was originally set up in 2001 as a pilot and quadrapled its production in 2009 following a major expansion. The grain used in the production (~ 550 000 t/y) is sourced from regional farmers and from export markets, and the steam required for the processes is provided by the nearby CHP plant. Majority of the stillage, a by-product rich in protein content, is turned into fodder (~ 190 000 t/y) and sold to animal farmers, while some fraction is used by the nearby biogas plant as substrate. Another organic by-product stream is bio-fertilizer, which is received by the local farmers (~ 8100 t/y). The plant also produces substantial amounts of biogenic carbondioxide (~ 170 000 t/y). This CO2 stream will be used in a new plant, that is under development by the time writing, for the production of industrial grade CO2. A biogas plant owned by Svenk Biogas was put into operation in Norrköping in 2007. The raw biogas produced in this facility is upgraded to vehicle grade (~ 4.2 million Nm3/y) and fuels biogas busses and cars in Norrköping. For some years the plant primarily used stillage from the nearby Agroetanol. However, since 2012, it is primarily using organic fraction of the household waste collected in Norrköping. The digestate (~ 48 000 t/y) from biogas production is used by the regional farmers as organic fertilizer. Econova is a company specialized in producing usable products from industrial and domestic waste streams – like a scavenger in natural ecosystems. The company receives a rather wide range of waste streams as input, and produces an equally wide range of products. Some examples of the waste streams processed by the company includes sludge and bark from paper industry, wood and combustable waste from industries, and bottom- and fly-ash from combustion facilities. Some of the products of the company, on the other hand, include waste derived fuels for energy plants, soil for gardening, materials for covering landfills, and plastic bags from recycled plastics. Reductions in greenhouse gas emissions: Having a CHP plant that is primarily fueled by waste derived fuels and biomass provides significant reductions in CO2 emissions. This is partly because meeting the heat and steam demand of domestic and industrial users by the CHP is a much more efficient altnerative as compared these users operating their own boilers. Moreover, the CHP plant is able to use waste-derived-fuels and biomas as fuel–thereby replacing coal or other fossil fuels–that would have been difficult to realize in individual boilers. In addition, thanks to the stable steam demand throughout the year from Agroetanol, CHP plant is able to produce more electricity, that has good environmental credentials. Additional CO2 reductions are enabled by the production of bio-ethanol and biogas and their use as a transport fuel, thereby substituting diesel and gasoline. Reduction of waste landfilling: The amount of industrial and household waste that needs to be landfilled is significantly reduced, by using such wastes as fuel in the CHP plant or as substrate for biogas production. Reductions in fossil-resource dependence: Bio-ethanol and biogas reduce the dependence on fossil fuels, whereas use of bio-fertilizers from ethanol and biogas production reduces the dependence on chemical fertilizers in agricultural activities. By meeting their heating needs through district heating–instead of running their individual boilers or direct electric heating– domestic, institutional, industrial and commercial heat users are realizing important economic benefits (only heat pumps are considered to be a competitor to district heating). Using household waste as fuel in energy production has economic benefits for the CHP plant, as the plant receives a gate fee for the domestic waste brought to the plant for incineration (here it needs to be noted that capital and operational expenses of a plant designed to use waste-derived-fuels are higher than those running on fossil fuels). Ability to send waste to the CHP plant also offers economic benefits for the municipality of Norrköping and industrial waste generators, as compared to other alternatives for managing their waste. Having a sizeable and stable client for steam, which is a higher-value product, is also an important economic benefit for E.ON, particularly in times of low electricity prices. While also being able to sell steam, E.ON is able to produce and sell more electricity due to Agroetanol's stable demand throughout the year. For Agroetanol, sourcing steam from E.ON has significant economic and business value. Economically, the company is able to avoid a substantial investment and operational costs linked to having its own steam system. However, Agroetanal derives further business value from such transcation, as the steam sourced from E.ON has very low CO2 footprint and htis significantly imrpoves the environmental profile of the ethanol produced. Production of high-quality animal food from solid residues is another imporant business leverage for Agroetanol. Through this dynamic, the company overcomes a costly operational bottlenect related to waste disposal and at the same time creates additional income streams. The ability to transfer thin stillage–the management of which as a waste stream would be problematic–to Svensk Biogas for biogas production, on the other hand, is providing Agroetanol with an important safeguard. 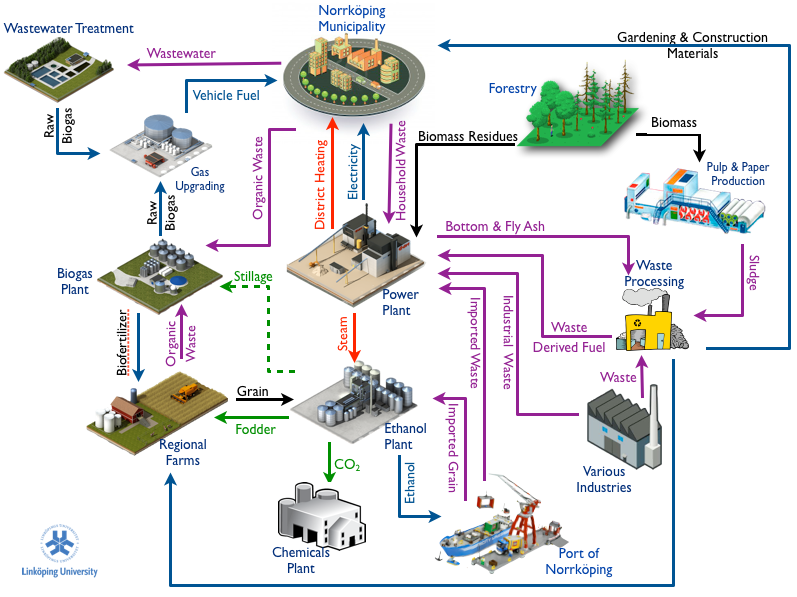 In a similar fashion, ability to utilize bio-sludge as fertilizer in regional agricultural activities reduces waste management costs for the ethanol and biogas plants. Farmers, that utilize the bio-sludge, on the other hand, are not only able to reduce their fertilizer costs and gain access to fertilizers suitable for organic agriculture. The strong position of the municipality and their environmentally motivated actions have been a key driver in Norrköping. Establishment of a district heating system, development of a CHP plant, and supporting the use waste and biomass as fuels are among such actions. The municipality has also been a key actor for the development of a biogas market in transportation. The business development department of the municipality has been instrumental for Agroetanol's decision to locate their plant in Handelö, in order to take advantage of the available steam. This department is still trying to promote the development of further synergies around steam, through giving priority to new industries that have a steam demand in their development work. Environmental regulations of the EU and/or of Swedish government also play a major role. For example, landfil tax regulations and other requirements of the Waste Framework Directive are among key triggers for making substantial amounts of waste available for energy recovery. Similar regulations prohibiting the landfilling of organic waste, on the other hand, are highly instrumental in stimulating the revalorization of organic waste fractions for biogas production or as bio-fertilizer. Energy and CO2 taxation policies of the Swedish government, on the other hand, supported increased update of more energy efficient solutions–like district heating or by-product heat utilization– as well as increased use of renewable fuel alternatives. Among the business drivers, and important element that needs to be note is Agroetanol's strategic decision to produce ethanol with high environmental performance. As the CO2 performance of the steam used in the distillation process has a significant impact on the overall CO2 footprint of the produced ethanol, access to low-CO2 steam from E.ON was an important factor in the company's decision to locate in Norrköping. It also needs to be noted that E.ON and Agroetanol has had a close partnership ever since. Thanks to this partnership, and long-term agreements between these companies, the expansion of the CHP plant (to enable more energy production using waste and waste derived fuels) was performed hand-in-hand with Agroetanol's expansion of its production capacity. The fact that there is high intensity of farming activities in the region also acts as a key enabler for some of the synergies. Local capacity of the farms to utilize the digestate produced as part of biogas production, for example, is a of vital importance. In the case of Norrköping, innovative capabilities and entrepreneurial mindsets of local enterprises is also acting as a strong driver for the devleopment of new synergies. In this regard, a local company called Econova is a good example. The company is continuously finding ways of turning various waste streams into inputs for productive uses. As noted earlier, Agroetanaol produces large quantities (approximatly 170 000 t/y) of biogenic CO2 in a relatively pure exhaust stream. Despite its negative image, CO2 is an industrial gas that is commonly used in various industries – like the beverage industry. Sweden, on the other hand, is a net importer of industrial CO2. There are now developments under way, to set up a plant, which will convert Agroetanol's CO2, into industrial grade gas. The relatively new saw mill owned and operated by Holmen produces significant quantities residuals – corresponding to an energy content of around 1.1 TWh. These residuals can be used for the production of wood pellets, bio-based chemicals, lignin based carbon fiber, and wood fiber foams.